EMMA'S EATERY: BUCA BUCA BUCA! 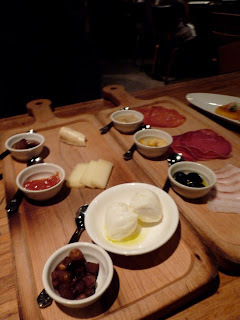 I am just beyond excited to post about BUCA Restaurant in Toronto! I have been DYING to go here and my I was finally dazzled by all that BUCA has to offer! 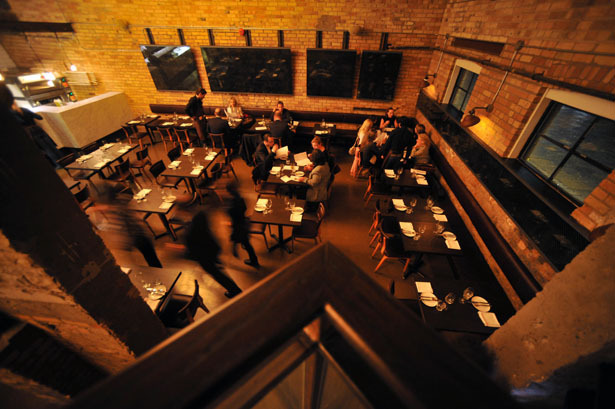 A new addition to Toronto's restaurant scene, and voted one of EnRoute's top 10 new restaurants in Canada, BUCA has taken Toronto by storm - booked solid! I luckily squeezed in last Thursday with over a week's notice for a reservation! Someone must be doing something right! BUCA is just off King St. (at Portland Ave) down a little alleyway in a historic building's old boiler room. The space is incredibly cool, fitting right into the King St. vibe! Old wooden tables, a glass wine cellar, open concept kitchen, brick walls and hanging lumieres give the space a beautiful rustic feel. We were seated right in front of the fabulous wine cellar and our server was just excellent. The speed of the service was impeccable, and a relaxing 2 hour dinner just somehow flew by! Before we even opened the menu for the food we saw the "date stamp," it has each day in order to incorporate the daily specials into the menu! Very cool. The menu is edgy Italian. The usual meats and cheeses to start, very simple fresh salads, an array of pastas, meat and fish and then some great "bianca" (white) & "al pomodoro" (red sauce) pizzas (which have little silver scissors to cut it up)! 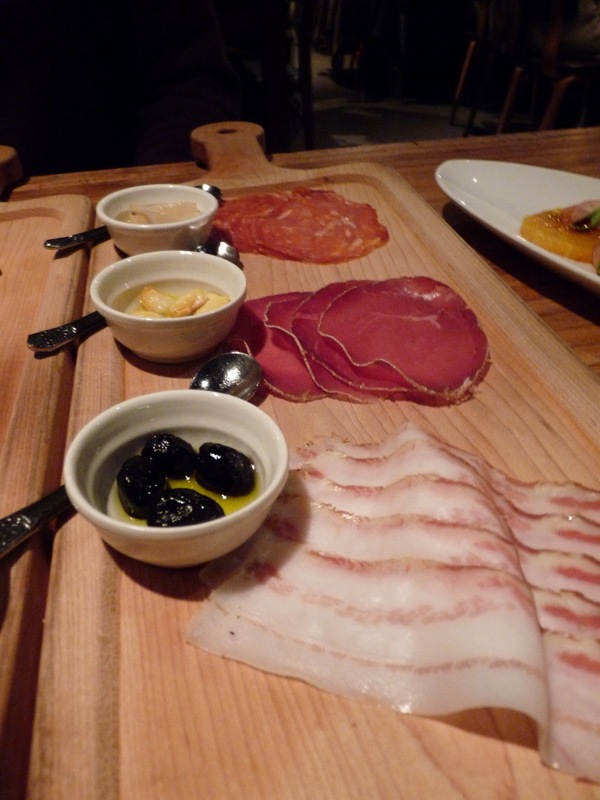 To start, charcuterie of course! Three meats, three cheeses. Some of the best pairings I have had. Each meat and cheese is paired with an accompaniment, and the detail that went into each of those pairings is truly incredible. 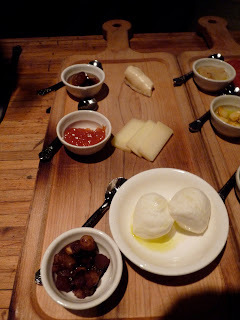 The taleggio cheese was the star of the show for me! Another must have to start - the "nodini" - warm bread knots with olive oil, garlic, rosemary and sea salt. I could have popped those little knots all night! To balance out the heavy meats and cheeses, the ever refreshing "arance e ravanelli" - naval and blood orange salad with heirloom radish, red onion, 30-year vinegar, olive oil and basil. This salad was a perfect combination of sweet, sour, and texture. A little crunch from the radish, just lovely! Before heading to BUCA I had read quite a few reviews just to get a sense of what the best main dishes were and the duck ragu kept popping up everywhere! However the minute I opened the menu my heart was stolen by the "mezze lune" pasta - sugar pumpkin filled pasta with taleggio fonduta, pregiato truffle and toasted pumpkin seeds. Pure bliss. What an incredible winter dish, from the pumpkin to the creamy taleggio sauce, topped with what else? TRUFFLES! By I convinced my date to go for the "bigoli" - hand cranked duck egg pasta with duck ragu, mascarpone and basil. This was a serious meat sauce, for all you general meat sauce lovers out there, this once TAKES the cake! (Also voted best pasta dish in Toronto by Toronto Life!!) 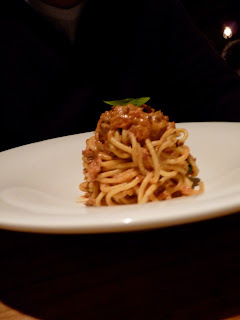 Such a light pasta, and the mascarpone cheese is so light as it is that the dish just felt like it was floating on air! The meal finally ended, much to my dismay, I could have stayed there all night. But BUCA fully lives up to the expectation. Rob Gentile has done a wonderful job with the place, with his training from mentor Mark McEwan fairing him well. So for all you Italian lovers wanting real, fresh, simple yet complex Italian food, this is the place for you. A great spot for parties and groups, BUCA should be at the top of your restaurant list! BUON APPETITO!